Dr. Chamith Nanayakkara, Chapter Leader Kandy, Sri Lanka, Albert Mah, Chapter Leader Perth, Australia, Ananda Mahinkanda, member of our San Diego Chapter, and Bob Isaacson, DVA President, were DVA’s representatives at the World Fellowship of Buddhists (WFB) Conference in Seoul, South Korea, and at the first ever Asian Buddhist Animal Rights Conference, co-sponsored by DVA. 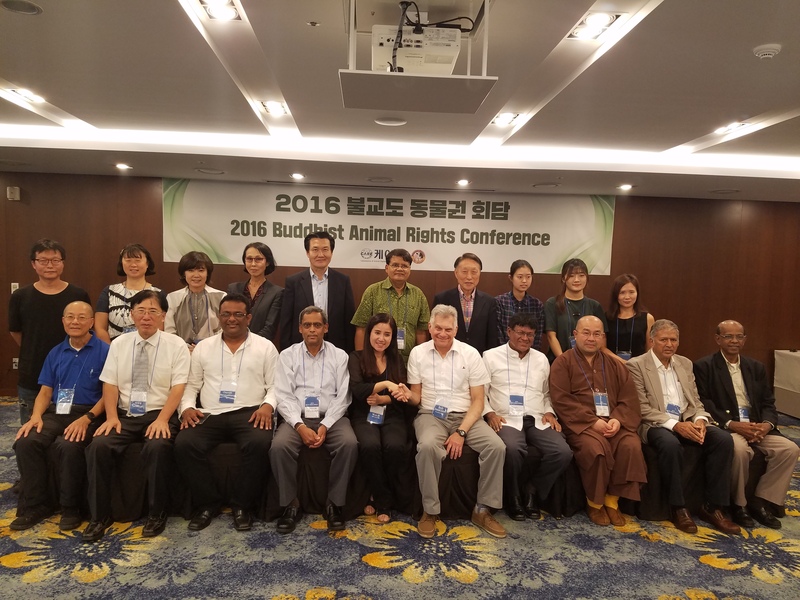 The 28th bi-annual conference of the WFB was held from September 26-30 at the Hotel Skypark, Kingstown, Seoul, South Korea. Approximately 500 representatives from the 189 Regional Centers around the world attended. DVA is the only animal rights/animal advocacy Regional Center in the WFB. The Conference was hosted by the Jin-gak Buddhist order of South Korea. One of the highlights of the conference was the meeting that all four DVA reps attended of the Standing Committee of Humanitarian Services. DVA is now an equal partner on that committee, working side by side with those fellow members who are focused on compassion for humans. 2)Master Hai Tao: Keynote: Why Buddhists should eat a plant based, or, at least, vegetarian diet. 3)Soyoun Park, CARE founder and president: Is happiness the exclusive property of humans? 4)Dr. Chamith Nanayakkara: Importance of implementing humane animal control methods. 5) Movie Director Yun Hwang: Mercy and peace of eating. 6) Prof. Changkil Park: What Buddhist organizations can do to protect world laboratory animals. After each of the six talks, attendees asked a variety of questions. Two interactive workshops were held during which everyone could process the teachings. The conference went extremely well. DVA is very grateful to have partnered with CARE, a non-Buddhist AR organization that does groundbreaking work in Korea. Notable participants in our AR conference included Phallop Thiarry of Thailand, the Secretary General of the WFB; Venerable Thich Phuoc Tan of Melbourne, Australia, one of DVA’s original members; Senaka Weeraratna, our Colombo, Sri Lanka Chapter Leader; Pai Lee, the President of the Buddhist Union of Malaysia; Dr. Basumitra Barua of Bangladesh, the co-chairperson of WFB’s Humanitarian Services Committee; and local Seoul DVA members, Sang-Kyu Park and Tae Gil Lee. 4) Educating the WFB on the importance of not comingling vegetarian and non-vegetarian food at the conference, as was done in Seoul, so that the many vegetarians in attendance, including all four DVA representatives, can make choices of what to eat consistent with their Dharma practice of non-harming and compassion towards all sentient beings. After our AR Conference ended, Ananda flew home to southern California and Chamith to Kandy, while Albert and Bob began their nine-day, three-city journey on behalf of DVA. They first visited Singapore, an island/city/nation of approximately 5.5 million people, approximately one third (almost 2 million) of whom are Buddhist. The trip began with a public talk at the Phor Kark See Temple where approximately 120 people attended a celebration of Vegetarian Day. Bob and Albert hopefully inspired the audience to follow the Buddha’s message and go veg. 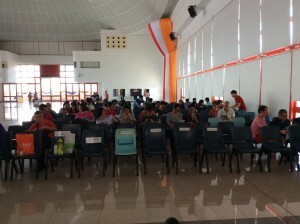 The photo shows the audience 15 minutes before the talk began. At this event about forty people became new DVA members, and we added both a new Chapter Leader, Meng Wei Chai (“Daniel”) and coordinator, Ng Xin Zhao, two really impressive additions to our DVA family. 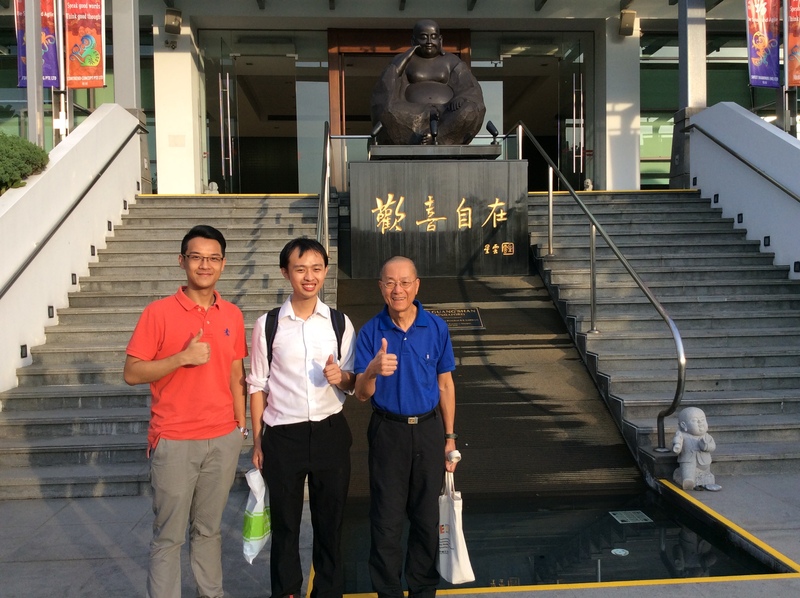 Daniel and Zhao then joined Albert and Bob as they visited the Fo Guang Shan monastery of the Buddha’s Light Association, meeting a wonderful group of vegetarian nuns, enjoyed dinner, and picked up additional DVA members. 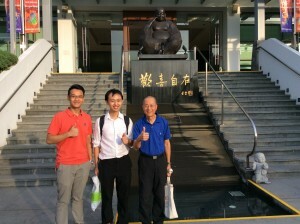 The photo shows, from left to right, Daniel, Zhao, and Albert outside the monastery. Albert and Bob spent the next afternoon with the Ven. 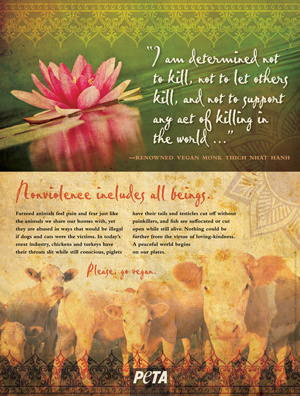 Shravasti Dhammika, who also became a DVA member and shared with us an interesting prospective on why so few Theravadan monastics are vegetarian. Daniel, Zhao, Albert, and Bob spent the evening with a group of doctors, sharing a Dharma talk on why we should practice as vegetarians and picking up still more members. Next stop was Kuala Lumpur, Malaysia where Albert was born, raised, and attended the university. The first day saw us meeting the senior monk at the Brickfields Temple where DVA member Bhante Henapola Gunaratana (Bhante G.) lived from 1957 to 1967. The senior monk there became a DVA member as we shared specific suggestions on how to talk to Buddhists about their diet. 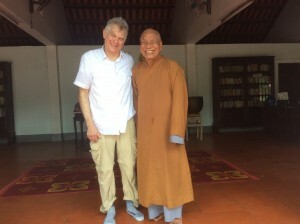 Our next stop was the Sentul Temple where Bob and Albert were welcomed by Bhante Saranankara, the Sri Lankan abbot who holds the position of “Chief High Priest of Malaysia,” the number one monastic in that country. 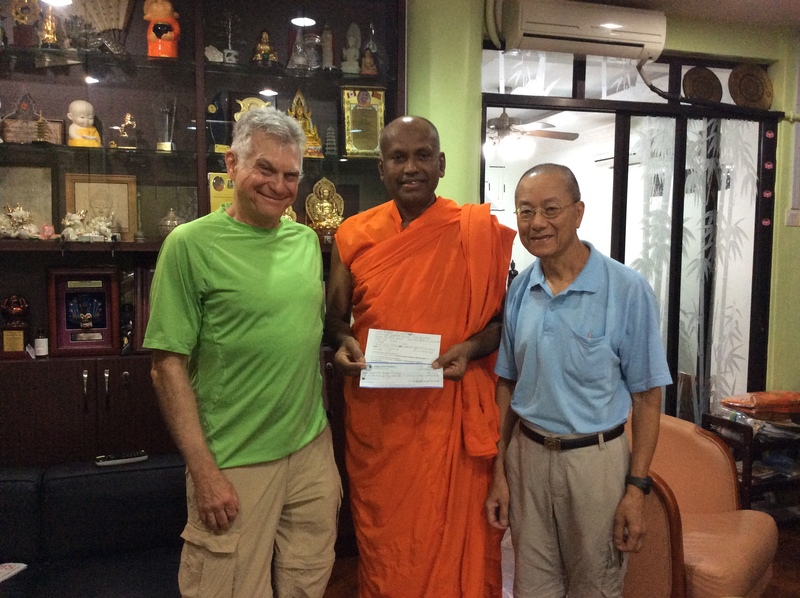 Bhante enthusiastically became a DVA member and helped by trying to set up a chapter in his city. Also joining DVA was Bhante Seevali, a professor of Buddhist Studies. 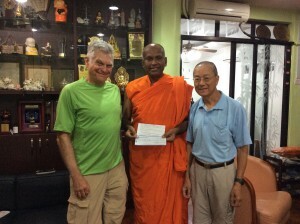 Bob and Albert returned the following day to the Temple and offered dana to Bhante on behalf of DVA. The photo shows this. Bob and Albert tried unsuccessfully to find the offices of Master Hai Tao in Kuala Lumpur. 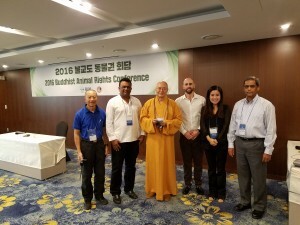 They had lunch with three members of the Buddhist Union of Malaysia, including President Pai Lee, with whom they connected the week before at the two conferences in Seoul. After brainstorming on how to begin a DVA chapter in Kuala Lumpur, all three lunch companions became members of DVA. 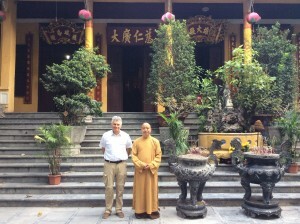 The next day Albert and Bob flew to Penang, the second largest city in Malaysia, to stay at the Than Hsiang Monastery as the guests of the abbot, the Venerable Wei Wu, who later became another member of DVA. Wei Wu also runs the International Buddhist College in Songkhla, across the border in Thailand. 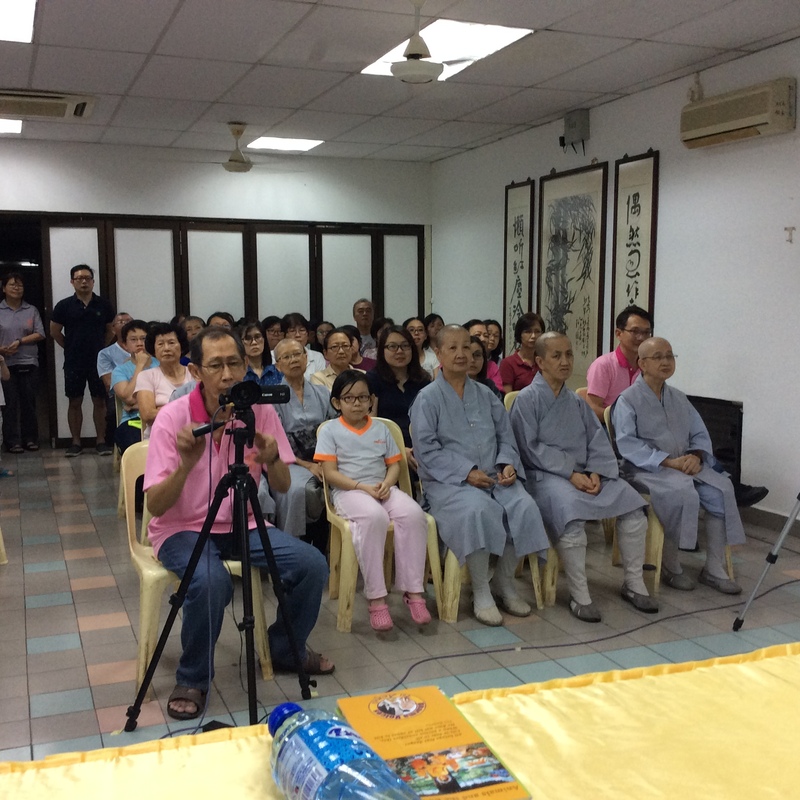 After visiting two more Buddhist centers on October 8 and adding their abbots as DVA members, Bob and Albert returned to Than Hsiang to present a public talk to 100 people. These two photos show the audience. After adding dozens of new DVA members, we hit the jackpot when Bob and Albert met two really impressive young men, Chhen Sela and Chii Chew Hong, selecting them as Penang, Malaysia Co-Chapter Leaders to launch a chapter in Penang. 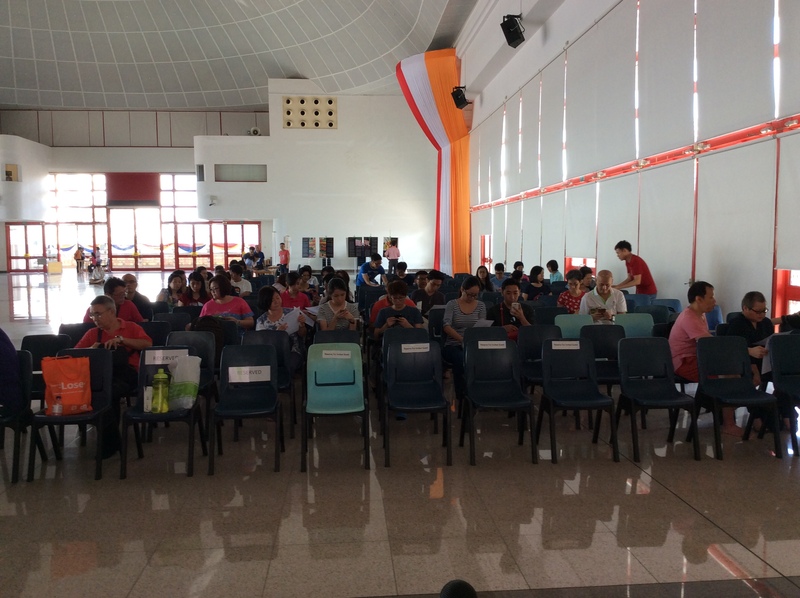 Sela and Hong then joined Bob and Albert the following day, driving to Ipoh, Malaysia to give yet another public talk to an audience of over 100 at a Buddhist Sunday school. 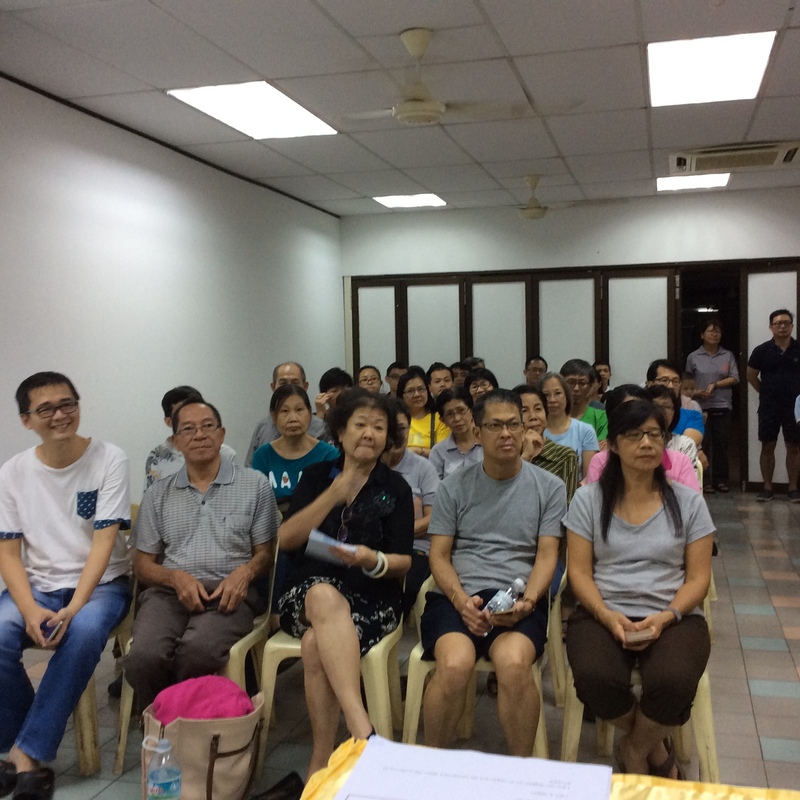 After Bob introduced Sela and Hong to the audience as our Penang Co-Chapter Leaders, the abbot of the Buddhist Center became a new DVA member. This photos shows Sela and Hong, the second and third from the left. Before Albert returned to Perth and Bob left for Vietnam, they gave their final public talk at the well-known Bodhi Heart Center. 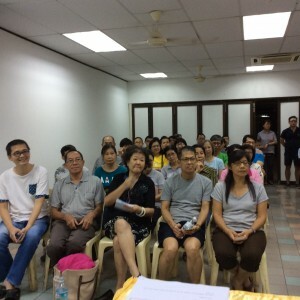 A number of new DVA members and also several Penang chapter members were added, and seeds planted for more compassionate diets. At their four public talks, Bob and Albert played Part I of our film, Animals and the Buddha, with Chinese subtitles. Albert then returned to Perth while Bob visited Vietnam, stopping first in Ho Chi Minh City (HCMC). Driving in a taxi from the airport to my hotel he was fascinated by the thousands of motor scooters weaving in and out of traffic, creating a mosaic of vibrant sights and sounds. The highlights of his Vietnam visit were meetings in HCMC, Hue, and Hanoi with leaders of the Vietnam Buddhist Sangha (VBS), the umbrella governmental organization that represents over 45,000 monastics and 14,000 Buddhist centers. Bob’s heart was warmed by hearing that all VBS monastics were vegetarian and all their centers served strictly vegetarian meals. The first VBS leader Bob Isaacson met was the Ven. Thich Tron Chon in HCMC. With the help of a translator the two shared their compassion for those animals who suffer so terribly on their way to our plates. Also during our 2 ½ hour meeting, the Venerable and Bob connected on the importance of being a voice for animals and the work that he and DVA has been doing for many years. The Venerable offered to help DVA by working with the leadership of VBS to identify specific projects to partner with DVA. Bob learned that many Buddhists in Vietnam eat only vegetarian food on the first and fifteenth of each month. The photo shows the Venerable and Bob. The second meeting with VBS was in the enchanting city of Hue with the Ven Thich Tri Tuu at his Thien Mu Pagoda, a must-see for every visitor to Hue. After working out some problems with a translator, the Venerable and Bob shared what they were doing to promote vegetarianism and veganism. The Venerable shared his three part approach: nurture affection for animals; teach about the benefits to animals, the environment, and our water supply; and educate others on the devastating effect of factory farming on global warming. Then a number of young, novice monastics, ages eight to eleven, joined and sang a song about the virtues of vegetarianism. Photo ten shows the Venerable and Bob. 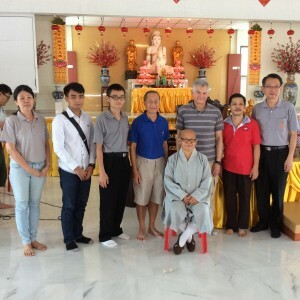 On the final leg of his official meetings with VBS, Bob paid a visit to its national headquarters at the Quan Su Pagoda in Hanoi, meeting its esteemed representative, Thich Thanh Huan. The Venerable shared that he regularly gives talks and conducts classes about not eating animals at both the Quan Su and the Phap Van Pagodas. He also has spent quality time with Thich Nhat Hanh, both in the U.S. and in Vietnam. Since DVA is planning to work very closely with the Venerable in promoting a vegetarian and a plant-based diet in Vietnam, we hope to invite him to the U.S. to give public talks, connect with the sizable Vietnamese-American community in California, and discuss specific ways that VBS and DVA will work together toward our common goal of relieving the suffering of ALL beings. The photo shows the Venerable and Bob. 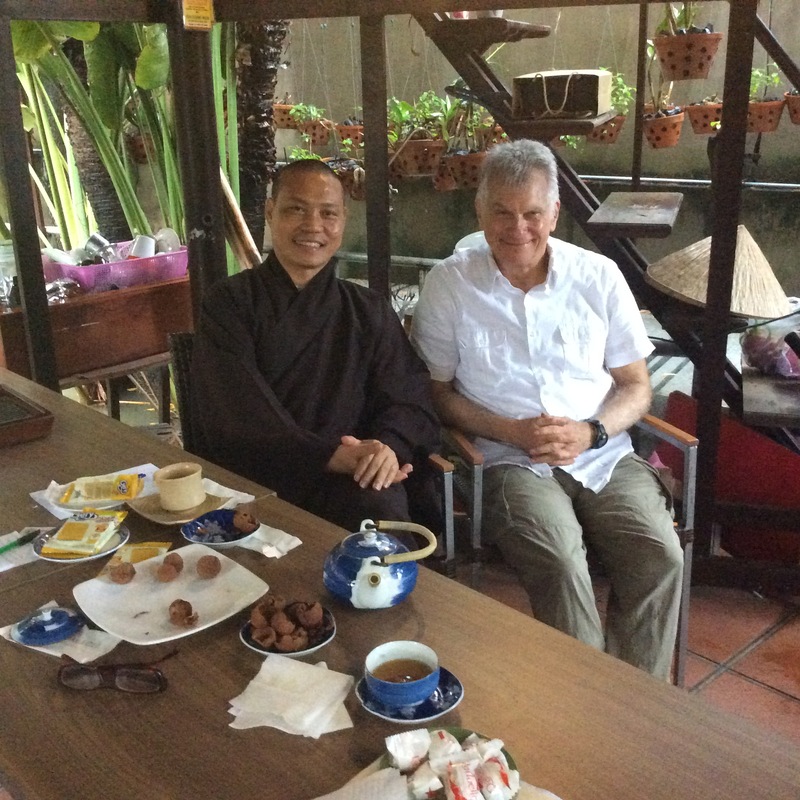 Finally, Bob met with the English speaking Thich Nhat Hanh Sangha, Moon Hamlet, in Hanoi, sharing DVA’s message in the context of Thay’s “first mindfulness practice,” leading a meditation, picking up all but one of the group as DVA members, and talking with a potential Chapter Leader. 1) Gathering information and ideas, such as the large number of Buddhists in Asia who are interested in becoming vegetarian but are worried about nutrition and how to cook vegetarian. 2) Disseminating information about what the Buddha taught about our relationship to animals by distributing our DVDs and brochures, giving public talks, and having countless conversations with one or more people. 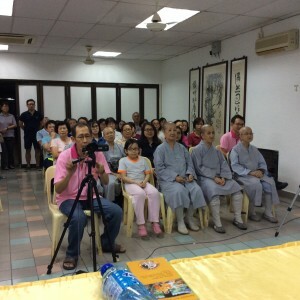 4) Adding a significant number of new DVA members, especially in Singapore and Malaysia, including increasing our group of monastics by nineteen or 40%. 5) Starting new chapters in Singapore and Penang, Malaysia with strong, young leadership. 6) Developing strong support for starting chapters in Kuala Lumpur and Vietnam. 7) Developing relationships with professors and leaders at Buddhist Universities, which hopefully will lead to adding courses on what the Buddha taught about vegetarianism. 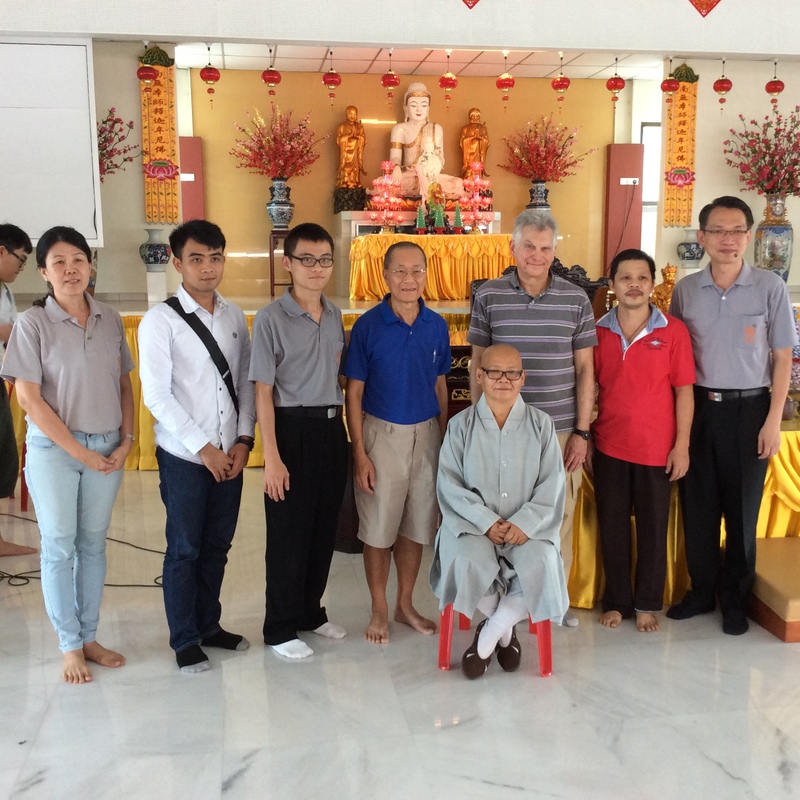 Our deepest gratitude to the Venerable Anandajoti, a long-time DVA member who works at the International Buddhist College in Songkhla, Thailand, for organizing major parts of our visit to Singapore and Malaysia!